Many many years ago an old friend of mine George Carhart brought me a copy of these rules back with him from America (originally published in 1979). For several years we used them until we moved onto other faster sets, purely because we wanted to use more tanks on the table, but they remain in my view, the benchmark against which all other rules are judged in terms of the detail and the accuracy of the fire resolution tables. Long out of print they remain my most cherished rule set. 1. Gun velocity which affects the virtual speed of the target. 2. Specialist optics (which reduces the drop off in target size over 500 metres). 3. Crew training (speed of target and target size adjustments). 4. Bonus for subsequent shots at the same target (increase in target size). 5. Defensive armour bonus for 45 degree armour hits. What got me thinking about these rules is that my chums at the local Harrogate club have been playing a few tank v tank games using the Bolt Action rules in 20mm. As I’ve said before, IMHO the Bolt Action rules work ‘okay’ but certainly in armour v armour aren’t anything special. In Follow Me working out the ‘to hit’ percentage you need takes a little bit of effort (although not as much as it might sound) but when your only using a few tanks each you can use a quality rule set IMHO. I’m going recreate the tables in Excel and some vehicle stats and plan to run a game in a few weeks. I’m playing with the idea of programming Excel to do all the calculations, but by the time you have typed in the factors, you could probably have worked out the number you need to roll ! LOL I shall be doing a few postings over the coming week or so to report how things go. Peter Rice introduced me to table top miniatures battles and war games. I miss his store. Did you play Follow Me with him then ?. Do you know if he is still alive, and if so how I might contact him ? Hi Darren, I'm Dave Parker, have been an avid historical miniatures gamer since the early 1970s. Peter and my older brother Chris introduced me to to tabletop historical miniatures at that time. Starting with AWI at Pete's first shop in Searsport, Maine, then Bath Maine at his shop where hundreds were introduced to gaming and each other. About 400 or so of us (including Peter) gather annually at a convention called Huzzah! in mid-May in Portland, Maine. 2019 will be our 10th anniversary Con. Peter has been running Behind Enemy Lines games there. The theme for this con will be anything with a "10" to commemorate the anniversary and "old school" gaming. It's great to hear that Peter is still gaming. Could you point him in the direction of my blog please, I would love to correspond with him. Buzz correctly stated Peter's web site (they are professional painters and scenery / everything builders of "museum quality") is http://www.changeofcommand.com/index.html. He and Andrea, his "Child Bride" do beautiful work. They produced and shipped a special gift for me to present my brother Chris for his birthday. The unit of Teutonic Knights fit his medieval game perfectly. Chris just posted some photos at https://chrisparkergames.com/german-knights/ there are also pics on the Maine Historical Wargamers Facebook page. This is a highly recommended group. Please sign on so you can see what's happening in New England. It may be cold this month, but the gaming is hot. Great to hear from you. 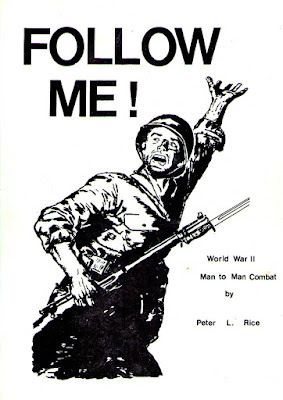 Your Follow Me rules are still after all these years one of my favourite set of rules for WW2 tank warfare. In terms of securing a hit on target, they are still the measure by which I judge other rule sets. Do you still use them ? Did you ever expand them ? Did you produce any other rules ? It's a shame the pond is between otherwise I'd love to visit New England.